When the Weatherball is glowing red, warmer weather's just ahead. When the Weatherball is shining white, colder weather is in sight. When the Weatherball is wearing green, no weather changes are foreseen. Colors blinking by night and day say, precipitation's on the way. On Thanksgiving Day in 1982, Minneapolis lost one of its most enduring landmarks--the Weatherball. It was perched atop the 14-story Northwestern National Bank building at 600 Marquette Avenue for 33 years. The Weatherball could be seen from 15 miles away at night, so there was no excuse for weather-cautious Minneapolitans to be caught unaware. A sing-along advertising jingle made the forecast easy to remember. Red meant warmer weather ahead, white meant colder, if it was blinking there was probably going to be some precipitation moving in, and green meant that you could expect more of the same. Unveiled with great fanfare on October 7, 1949, the Weatherball was hailed as the tallest lighted sign between Chicago and the West Coast. 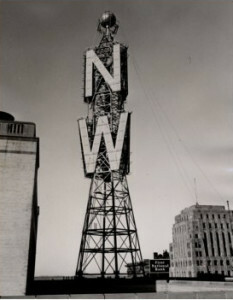 The base of the sphere sat 367-feet above the street and was the topmost feature of a 78-ton illuminated sign that flashed “NW” in 30-foot letters, followed by “BANK” in 13-foot type. The Weatherball was illuminated by 1¼ miles of neon tubing and built to withstand winds of up to 140 miles-per-hour. In fact, it survived hurricane-force winds just three days after it began operating. In its early days, the National Weather Service would call the bank each day at 4:14 p.m. to have a bank employee set the color of the Weatherball. In 1977, a direct line to the National Weather Service office at the airport allowed it to be updated four times per day via keypad and verified by using binoculars. The Weatherball was so popular that it became a cultural icon in the Twin Cities. In 1950, Mr. Weatherball was introduced. The cartoon gave spirit to the big steel sign and took on a life of his own. The Weatherball dining room opened on the top floor of the bank building with Weatherball silverware, placemats, and matchbooks. That same year, smaller versions of the Weatherball appeared at nine other Northwestern National Banks in neighborhoods around the Twin Cities. Beginning in 1959, customers opening a savings account with a deposit of $25 or more could receive a collectible Weatherball coin bank. On Thanksgiving Day in 1982, a fire started by arsonists in the vacant former home of Donaldson's Department Store destroyed an entire block of downtown Minneapolis--including the Northwestern National Bank building. The structure was damaged beyond repair and was scheduled to be demolished. The Weatherball was spared damage from the fire and plucked from the tower by a helicopter before demolition. On January 26, 1983, a construction crane lowered the beloved beacon gently from the top of the burned-out building onto the street. The Weatherball was donated to the Minnesota State Fair with the intention of it being restored and placed on the fairgrounds. Instead, it languished in storage for 17 years until it met its fate at the scrap yard. The Northwestern National Bank Building, built in 1930, was razed a couple of months after the Weatherball was removed. The Wells Fargo Tower now stands in its place. "Minneapolis Weatherball." Weatherwise. Vol. 3, 1950. Archives of the Minneapolis Star Tribune.